Description Hand coloured. Size 33cm x 41cm (13” x 16”). Political humour. 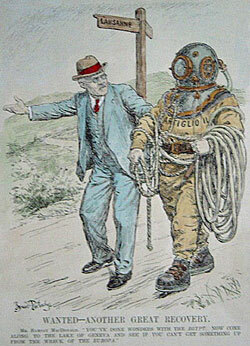 Ramsay McDonald (British priminister at that time) talking to a diver from the Egypt salvage before going to the Lausanne summit to try and solve Europe's financial problems.